These repaints are for the Viking Air CL-415 (formerly owned by Bombardier) serving in the 43° grupo - Ejercito del Aire. Textures only by Lilian regal. Requires original Bombardier CL-415_V2_FSX by Massimo Taccoli. These repaints are for the Viking Air CL-415 (formerly owned by Bombardier) serving in the French Securite Civile. Textures only by Lilian Regal. Requires original Bombardier CL-415_V2_FSX by Massimo Taccoli. FSX/P3D Embraer EMB-120 N16731 'The Dog' package. This aircraft is painted in the livery of MRW Racing 'the Dog' livery. The Embraer EMB120 Brazilia is produced by Embraer in Brazil. 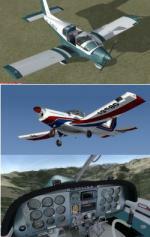 The Eric Cantu original EMB120 updated to FSX native format by Eagle Rotorcraft Simulations. Added the paint by Cinthia Sanchez. Fixed wheel sink. Uses the updated King Air panel and VC. Assembled and tested in P3D v4.2 by Chris Evans. Should also work in FSX and previous P3D versions. 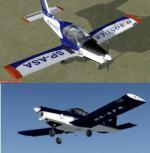 P3D/FSX Zlin Z-142 6 plane Package. The Zlin Z 42 is a single-engine two-seat Czechoslovakian trainer aircraft manufactured by Moravan Otrokovice. The Z142 version is the most popular. Textures: Czech AF 0559, Czech Blue, HA-SFS Hungarian private, Russian RA-1958G, SP-ASA' from 'Aeroklub Orlat' w Deblinie, Poland. High quality FSX Native model by PWDT. Added the high quality textures by Tibor Kokai, Andras Bereczki, Mikolaj Suszek and Tom Tiedman. Tested in P3D v4.2 and should be compatible in FSX and earlier P3D versions. PLEASE READ DOC FOR STARTING, ETC. Package assembled by Chris Evans. THIS LITTLE PLANE REQUIRES CAREFUL PILOTING. PRACTICE MAKES OK.